Bangles and Beads was created by a mother and daughter team in 1985. It primarily carried jewelry with a small collection of beads. Today, with the addition of a third generation, the store has expanded into one of the largest collections of beads and jewelry supplies in the United States. Covered from floor to ceiling in beads from around the world, you can find all of your beading needs at Bangles and Beads. 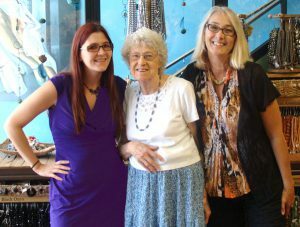 The staff is overwhelmingly friendly and knowledgeable, ready to assist you with any beading questions you might have. They offer great advice on what materials to use for any given project. They also give easy instructions to beginners on how to make a necklace or pair of earrings. If you are planning a trip to Richmond, VA, stop by our Carytown store!